On Tuesdays last year, we here at the Triangle brought you the most-named column in football, “The Fabulous and the Flops,” in an attempt to reveal some of the numbers flying beneath the radar about each NFL game from the previous week. This year, we’re shifting things around; instead of a little blurb or two on every single game from the previous weekend, our focus will move to deeper analysis of a few selected games each week. The hope is that you’ll gain some insight into what actually happened on the field that you wouldn’t get from a highlight package or game recap, aided by a mix of statistics and game tape (including that vaunted All-22 film). The hope is also that we’ll come up with a wordier name than “The Fabulous and the Flops”. This week, we’re going to start in New Orleans, where Robert Griffin III torched the Saints as part of a stunning Redskins upset. You’ve seen that slant to Pierre Garcon a million times by now, but what did the Redskins change about their offense to fit RG3? And what does it tell us about how the Redskins — and Saints — might look going forward? 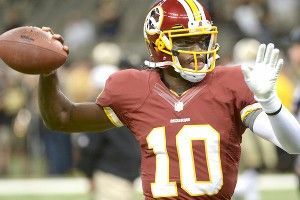 In his introduction to the professional ranks, RG3 brought along a trusty old friend: the Baylor offense. As our colleague Chris Brown noted on Twitter, the Redskins imported some of the concepts and simple reads from the Baylor playbook to give Griffin a low-risk opening sequence to work with. Offensive coordinator Kyle Shanahan crafted a game plan that built upon each look he’d presented to the defense on previous plays, creating space for Griffin while remaining one step ahead of the competition. And that competition? Well, the Redskins couldn’t ask for a much better defense to go up against playing this style of football than the Saints. The end result was a truly impressive offensive showing, but one that might struggle to reoccur in the coming weeks. It all starts with how the Redskins positioned RG3 in their backfield. Regardless of the down, distance, and situation, the Redskins rarely lined up Griffin directly under center in a traditional formation. Instead, RG3 spent most of his time alternating between the Shotgun and the Pistol, a shallower Shotgun formation where the quarterback lines up with a running back behind him. (More on the Pistol from Chris Brown here.) The Redskins kept RG3 off the line of scrimmage on virtually every meaningful offensive snap of the game, and just as it did with Cam Newton a year ago, the threat of a running quarterback kept linebackers frozen and allowed the Redskins to stretch the field both horizontally and, eventually, vertically. Part of the credit for that shift must go to the younger Shanahan, who was humble enough to mix in the concepts of an unfamiliar game plan with the tried-and-true concepts of his family’s more traditional attack. Even more impressive, though, was how Shanahan called his game against the Saints. After starting the game with a bubble screen, Griffin lined up in the Pistol and executed a simple zone read, a two-option run that’s a hallmark of notable college offenses from the past decade. When Griffin saw defensive end Cameron Jordan crash down to defend against a possible handoff to halfback Alfred Morris, Griffin simply ran around the vacated end and went untouched for 12 yards. The Redskins then used that simple zone read, that first impressive carry from Griffin, as a base for their entire offensive scheme. Two plays later, they faked the handoff to Morris out of the Pistol again and threw a quick hitch to the right side of the field, with Garcon going for an easy eight yards. They ran it to the left side on the next play for an even easier first down. When Jordan was more disciplined and didn’t crash down into the line of scrimmage, Griffin handed the ball off to Morris for a few yards up the gut. And then, after another quick play fake out of the Pistol, they threw a swing pass to Brandon Banks that turned into a first down when one Saints defender (Patrick Robinson) fruitlessly ran himself out of the play trying to get an interception and another (Malcolm Jenkins) missed a key tackle. That’s part of the reason why this offense was so successful in this particular matchup against this specific defense. If there was a player who could serve as a representation for the Saints and their style of defense over the past few years, it would be departed cornerback Tracy Porter, a speedy ball hawk who skipped on the day they taught sound tackling. A low-risk, high-percentage offense like the Redskins going up against a defense like New Orleans is like a baseball team that puts a lot of balls in play going up against a terrible defense that relies on strikeouts from their pitching staff. (The Saints were also without defensive leader Jonathan Vilma, who might have helped shift the Saints into better positions pre-snap and done a better job of reading those Washington plays on the fly.) By virtually eliminating the possibility of an interception and forcing the Saints to successfully defend against screens and quick hitches all day, the Redskins created tons of opportunities for the Saints to screw up and put their weaknesses on display. Of course, that’s exactly what ended up happening. That long touchdown pass to Garcon actually came on one of the most conventional plays the Redskins ran all day. On their first drive, the Redskins only lined up with RG3 under center once, producing a short gain on a running play. They opened up their second drive in the I-Formation and the Saints promptly pushed 10 men toward the line of scrimmage, leaving a single high safety in coverage. At the snap, Jenkins (27) blitzes toward the ball in the hopes of shooting in and making a play in the backfield, but the play-action freezes him long enough to create a throwing lane for Griffin. Roman Harper (41), the high safety, tries to crash the play and either make a big hit on Garcon or create an interception, but his angle of pursuit is abysmal and he ends up coming in behind the route. Garcon makes an impressive catch, and then he gets help from teammate Josh Morgan (an excellent downfield blocker), who takes out one defensive back just before occupying a second one with his eminently blockable self, creating a one-on-one race to the end zone that Garcon wins over Robinson. It was a well-designed play in the context of a broader game plan that turned into a highlight when the Saints threw in a simple mistake. As the game wore on, the Redskins sprinkled in more wrinkles to their basic offensive strategy. They began running Morris outside on sweeps out of the Pistol, and even busted out a very traditional triple option on a play that nearly got Griffin killed. And then, occasionally, things would break down and Griffin would throw 30-yard strikes across his body to the sideline as if that were something human beings do on a regular basis. It was certainly fun to watch, but we have our doubts about the Redskins being able to keep up this sort of performance over the rest of the season. Obviously, they’ll play defenses that are more disciplined and better at tackling than New Orleans. The Redskins also had the element of surprise on their hands; Washington ran a few Pistol plays during the preseason, but they otherwise used a vanilla attack that would have offered little to the Saints on film. The cat’s out of the bag now. Tape isn’t enough for teams to shut down the Redskins, but it will give them ample time to practice and prepare. The game plan also requires a ton of movement by Washington’s offensive linemen in terms of getting off the line of scrimmage and moving downfield and/or to the sidelines to block; that’s going to create wear and tear and tucker them out as the season goes along. It’s notable that the Redskins didn’t really run the ball all that well, as their 44 carries only produced 3.5 yards per pop. Morris got 28 carries and produced just 96 yards, which doesn’t bode well for his viability as the starter over the next 15 games. In addition, there were some ways in which the Redskins just got lucky. RG3 didn’t throw many contested passes, but one of them was a would-be interception in the end zone that Patrick Robinson wasn’t able to hold on to. There were four fumbles in the game, and the Redskins ended up recovering each of them. That included a fumble by Marques Colston on a play in which he was streaking into the end zone, only for the ball to roll out of the back of the end zone and produce a touchback for the Redskins. There was even a fifth fumble called back by a questionable declaration of forward progress; Washington recovered that one, too. The Redskins did a good job on Drew Brees, but they were mostly able to shut down Saints drives by forcing New Orleans into third-and-really-long situations. Four of New Orleans’s first six drives ended with them having to pick up double-digit yardage on third down, including two different third-and-20 scenarios. Nobody has any plays in their playbook for third-and-20. The Redskins are going to be a very fun team to watch this year. They made the Saints look downright foolish on defense on Sunday, and when they’ve got their offense going, it’s going to make other defenses look bad, too. We just feel like they might have had the perfect combination of factors on Sunday to produce a great game. Redskins fans with their heads in the clouds after Griffin’s debut might want to lower their expectations from “instant Hall of Fame offense” to “pretty good offense with some hiccups” going forward. Meanwhile, as Griffin blew up in New Orleans, the patron saint of lazy comparisons was getting shut down due south in Tampa. Cam Newton might have been without one-half of his $50 million backfield, but the combination of Newton and DeAngelo Williams was expected to be plenty of bad road for the dismal Tampa Bay rush defense. Instead, the Buccaneers shockingly held Carolina’s rushing game to just 10 yards on 13 carries, which ended up being a huge factor in their 16-10 upset victory. Did the Panthers suddenly get terrible, or did the Buccaneers suddenly develop a stout run defense? You won’t be surprised to hear that it’s a bit of both. We went back and rewatched every running play the Panthers tried to execute, and there were a variety of notable factors that popped up. First was just how well the Buccaneers’ defensive line played against an offensive line that’s regarded as excellent run blockers. Do you remember Gerald McCoy? You know, the guy who was drawing legitimate comparisons to Ndamukong Suh when they were both at the top of the 2010 draft class? He dominated the Panthers on Sunday. He sliced up Carolina’s second running play of the day for a loss, and the Panthers consistently struggled with keeping him out of their backfield. He threw in a sack and two knockdowns of Newton in the passing game, too. McCoy’s linemates were also consistently able to drive Carolina offensive linemen into the backfield and eliminate rushing lanes for Newton, Williams, and Mike Tolbert. The Panthers were running zone read plays similar to the ones that Griffin and the Redskins were experimenting with in New Orleans, but while the Redskins were able to freeze linebackers with their fakes, Carolina’s fakes just gave the Bucs linemen more time to drive their blockers into the eventual ballcarrier. In particular, guards Amini Silatolu and Geoff Hangartner were notably unable to do much more than get bowled over and apologize to Newton in the huddle. (Another play saw several offensive linemen simply let their blockers through like a screen, only to find that Newton was in the process of beginning a triple option. It didn’t get very far.) The likes of Roy Miller and Michael Bennett aren’t household names, but they were enough to get the job done versus Carolina on Sunday. Once the Buccaneers got ahead by two scores, the Panthers had to go pass-heavy and neglect the run (if not entirely abandon it), which limited the number of carries that actually could be part of our analysis. As the weeks go on, we’ll begin to get a clearer view and be able to determine which side was truly the catalyst for this unexpectedly poor rushing performance. If you want a percentage split, it seemed like the stifling of the Carolina running game was 60 percent Buccaneers defensive line and 40 percent Panthers offensive line, but ask us again when the Bucs finish up their upcoming three-game slate with the NFC East, where they’ll line up against the Cowboys, Giants, and those aforementioned Redskins. The Jaguars and Vikings exhibited just how silly it is to outlay significant cash on a kicker during their back-and-forth tilt on Sunday. For all their investment in Josh Scobee, the Jaguars lost this game because their kicker was badly outperformed by a guy making close to the league minimum: rookie sixth-rounder Blair Walsh. You probably saw Walsh’s clutch kick from 55 yards to tie the game at the end of regulation, one of four field goals Walsh put through the uprights for the Vikings on Sunday. What led up to that successful kick, though, was a dismal day for Scobee. Walsh’s 55-yarder came after the Vikings moved the ball from their own 31-yard line to the Jacksonville 37 in 20 seconds. They took over on the 31 because Scobee’s kickoff was, well, disappointing. Instead of squibbing it or kicking it deep for a touchback, Scobee split the difference and shanked his kickoff to the 8-yard line, where the Minnesota upback had to take ownership of the ball. That’s not quite as bad as John Kasay’s kickoff out of bounds in Super Bowl XXXVIII that set up the Patriots for their final drive, but had the Vikings let Scobee’s kickoff go, it very well might have given them the ball on the 40, too. Either way, Scobee needs to execute on that kickoff. Scobee’s other notable transgression was entirely not his fault; he kicked an 18-yard field goal. That field goal was Mike Mularkey’s call, who chose to kick the field goal from the 1-yard line in a 0-0 game with 48 minutes to go. You can make all the arguments you want about momentum and coming away with something after a long drive, but the facts are simple; you’re almost always going to get more out of going for it than you are by kicking a short field goal. Unless it’s the fourth quarter and you’re aiming for a particular scoreline, your goal as a coach should be to increase the score differential by as many points as possible, and that’s going to occur by going for it in this exact scenario. To continue the baseball metaphors, Mularkey kicking a field goal from the 1-yard line is like a coach setting up a sacrifice bunt in the second inning of a 0-0 game at a hitter’s park. In fact, because a failure would still pin Christian Ponder & Co. inside their 1-yard line, it’s even more egregious. Brian Burke’s fourth-down calculator suggests that it’s an easy decision to go for it unless you think your odds of making it are 32 percent or less. The game’s other notable players had hit-or-miss nights. Blaine Gabbert looked great when the Jaguars offensive line was able to keep Jared Allen & Co. off of him, but that’s not a surprise; the Vikings might have the least-pedigreed secondary in football. When the Vikes had even a little bit of pressure on Gabbert, he began to bumble. Gabbert even underthrew a shovel pass that might have gone for a first down, a contrast to when John Skelton overthrew a would-be touchdown on a shovel pass elsewhere in the day. Gabbert’s long touchdown pass to Shorts was undoubtedly a professional career high for both, but he’ll struggle against better secondaries. Adrian Peterson, to interrupt all this back-patting, played much better than we expected. He certainly wasn’t making guys miss with his moves like the old All Day, but he was effective enough in the open field and seemed to grow stronger as the night went along. Even more promising was that he woke up on Monday with no swelling in his surgically repaired knee from his 17-carry day. The two touchdowns probably overrate how meaningful his role in the game was, but even if Peterson was at 85 percent or so on Sunday, that’s enough to justify him being on the active roster. He’s not all the way back, but he’s back. We’ll be wrong about plenty of things in 2012, but the healthy return of an elite player like Peterson is one of the more exciting things to be wrong about.